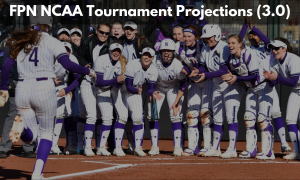 Weekend one of the 2019 DI NCAA Softball season surely did not disappoint. 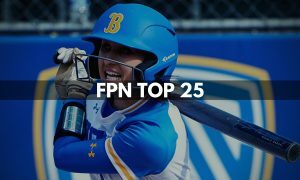 Freshmen shined, upsets happened, programs picked up statement victories, there were many standout performers, big questions were raised, and an absurd fluke handed a top five program their first loss. In arguably the most anticipated team taking the field this past weekend, Oregon came out with a bang! The Ducks defeated Kansas (14-5), CSUN (12-5), Mizzou (6-1), Bradley (13-3 in five innings, and Seattle (8-6) while hitting .389 as a team. Next weekend Oregon will face tougher tests in No. 8 LSU and No. 20 James Madison but for now the Ducks and their fans have a lot to celebrate after a great start to 2019. Another program beginning a new era, the Tigers also had a lot to hang their hats after the first weekend of play defeating Utah (9-0 in six innings)), No. 11 ASU (8-0 in five innings), and border rival Kansas 3-2. Head coach Larissa Anderson’s team dropped two contests to No. 12 Oregon (6-1) and Oregon State (4-3 in eight innings) however there were many positive takeaways for the Tigers to build off of: with more timely hitting and cleaner defense both of those games could have easily gone in Mizzou’s favor. Make no mistake, this Illinois program can flat out hit; it is the Illini’s pitching that has been their achilles heel. This past weekend the bats showed up and the pitching staff delivered enough to propel Illinois to impressive victories over No. 15 Oklahoma State (7-4), Kentucky (6-5), and Houston (4-2). They did also drop two contests to No. 15 Oklahoma State (6-10) and Sam Houston State (6-10). The tale of the tape for Illinois this season will yet again be their pitching staff. One of the most surprising programs of opening weekend, NC State showed out against a tough slate of opponents. The Wolfpack posted a 3-2 record with wins over Illinois State (10-9), USF (2-1), and No. 7 Arizona (4-1). NC State also gave No. 10 Michigan and No. 4 Florida all they could handle. The Pete D’Amour era has started with a bang! The Hokies went 5-0 on the weekend with wins over Wichita State (11-3 in five innings), Central Michigan (6-0), Purdue (7-5), College of Charleston (13-0 in five innings), Purdue (5-0). The Hoosiers picked up where they left off in 2018 after an impressive first campaign under new head coach, Shonda Stanton. Indiana posted a perfect 5-0 record this weekend including a 6-4 win over No. 9 Georgia. This is the best season start for the Hoosiers program since 1990. The Gators posted a 5-0 record including victories over No. 10 Michigan, No. 7 Arizona, and an impressive NC State team. They hit .321 as a team while the pitching staff combined for an ERA of .85. Other teams that performed well and took care of business as expected include: Louisiana, Florida State, Texas, Arkansas, Tennessee, Oklahoma, and UCLA. The New Mexico State Aggies got off to a strong 4-0 start thanks in large part to the performance of senior, Victoria Castro. The center fielder hit .429, scored eight runs, lift three home runs, fives RBIs, drew eight walks, and recorded an on base percentage of .733. Barnhill was Barnhill during opening weekend posting a .50 ERA and 3-0 record over 14 innings. She allowed only one earned run, one walk, and fanned 15. 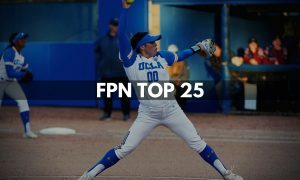 She Barnhill threw the complete game victory over No. 10 Michigan. 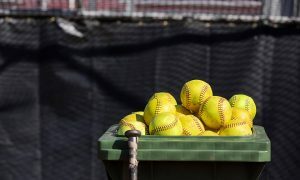 The Oregon State transfer carried the Gophers’ offense this past weekend with a .556 batting average, three doubles, two home runs, seven RBIs, two walks, and slugged 1.1556 through three games. In one of the best story lines of the weekend, Oregon’s success can be heavily attributed to Rachel Cid who hit .471 over 17 at bats. 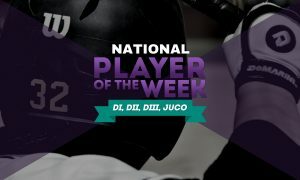 She scored seven runs, notched three home runs, 10 RBIs, five walks, and boosted a .591 on base percentage. Maddie Hackbarth “went off” this weekend with a dazzling stat line. She hit .583, blasted three home runs, notched 10 RBIs, and recorded a .615 OBP. The Aussie freshman for the Ragin’ Cajuns kicked off her career in statement fashion throwing a no-hitter against Incarnate Word and posting a line stat line of: 0.00 ERA, 2-0 record, 16 strike outs over 10 innings. 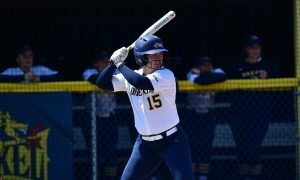 Louisiana blew up the ball (.476 as a team to be exact) this weekend and O’Neal led the way hitting .714 with 10 hits, three doubles, one home run, five RBIs. Dejah Mulipola is a name we’ll be hearing about all season, she finished an impressive weekend hitting .533 with one double, three home runs, six RBIs, and a .563 OBP. Another big bat for the Wildcats, Palomion shined hitting .500 over 16 at bats with four home runs, five RBI, two walks, no strikeouts. Northwestern is a team to watch this season and freshman Jordyn Rudd will be a big reason why. She hit .467 with three doubles, two home runs, 10 RBIs, drew two walks, and posted an on base percentage of .529. In her first weekend in Purple and Gold, Sanchez didn’t miss a beat. She hit a whooping .700 with five doubles, nine RBIs, slugged 1.200, drew six walks, and posted an on base percentage of .824. Sims kicked off he 2019 season with a 0.00 ERA over 12 innings of work allowing no runs while fanning 16 batters. 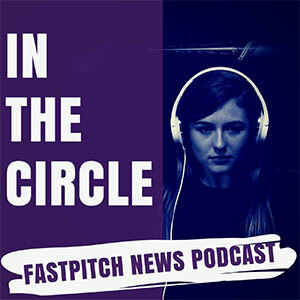 She threw a no-hitter over Army and another five innings of shutout work versus Mercer. 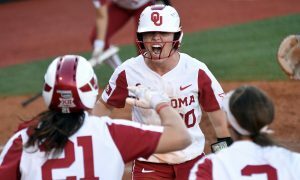 Former LSU Tiger, Sydney Springfield also picked up right where she left off and leading the Oklahoma State offense hitting .462 with two doubles, two home runs, and four RBIs. NC State made waves this weekend competing with some of the nation’s top talent. Devin Wallace performed well finishing with a .91 ERA over 15.1 innings of work while only allowing two earned runs and striking out 11. Freshman Shelby Wickersham made her collegiate debut for LSU in a memorable way: throwing a five inning no-hitter versus Tulsa. This is only the sixth time in program history a freshman as thrown a “no-no”. Another program who enjoyed a fast start to the season, Virginia Tech has a lot of positives to build on moving forward and the performance of Caitlyn Nolan is one of them. Nolan hit .714 with three doubles, two home runs, nine RBIs. Following the loss of Giselle Juarez this summer to transfer, ASU’s pitching was a big question mark coming into the 2019 season. After opening weekend, that question is still not yet answered. Cielo Meza had a disappointing weekend and will need to be better moving forward. A positive for the Sun Devils is their offense which hit .393 collectively. If the pitching puzzle can come together they should be okay. The Orange played one of the tougher opening schedules this past weekend and went 1-3 dropping two games to No. 3 Oklahoma and one contest to San Diego State. Their lone win one the weekend came against GCU, 3-2 in eight innings. The bats were cold for Syracuse and pitching struggled a bit as well. Again, this slate was tough and should only benefit them moving forward if they can regroup, learn, and make adjustments. The Tigers had a disappointing first weekend of play dropping two contests to Missouri State and a strong Louisiana Tech team. While it isn’t time to panic for the Auburn faithful the Tigers will need to learn from these games and move on quickly. The Wildcats have a history of struggling during opening weekend so don’t write them off quite yet though they will need to pull the pieces together quickly. Kentucky went 2-3 on the weekend including losses to Illinois, Houston, and Oklahoma State. Notre Dame bested No. 5 Washington …kinda of. 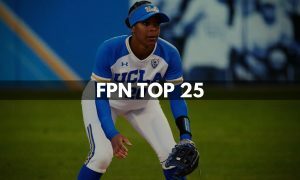 The Fighting Irish and Huskies were locked in a 1-1 match up into the eighth inning when Washington took the lead off a Kaija Gibson RBI double that brought in pinch runner, Francesca Torraca. Gibson was thrown out attempting to take third base on the play. 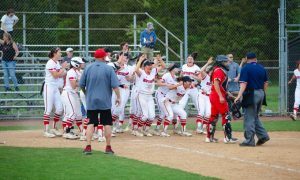 Events transpired and the umpires ruled that said pinch runner was entered incorrectly resulting in the third out, ending the game. This is to take nothing away from Notre Dame who played a great game but it’s an upsetting loss for Washington on a bizarre series of events.